The transformation of the nation’s news landscape has already taken a heavy toll on print news sources, particularly print newspapers. But there are now signs that television news – which so far has held onto its audience through the rise of the internet – also is increasingly vulnerable, as it may be losing its hold on the next generation of news consumers. Online and digital news consumption, meanwhile, continues to increase, with many more people now getting news on cell phones, tablets or other mobile platforms. And perhaps the most dramatic change in the news environment has been the rise of social networking sites. The percentage of Americans saying they saw news or news headlines on a social networking site yesterday has doubled – from 9% to 19% – since 2010. Among adults younger than age 30, as many saw news on a social networking site the previous day (33%) as saw any television news (34%), with just 13% having read a newspaper either in print or digital form. These are among the principal findings of the Pew Research Center’s biennial news consumption survey, which has tracked patterns in news use for nearly two decades. The latest survey was conducted May 9-June 3, 2012, among 3,003 adults. For more on the growth of mobile technology, see the Pew Research Center’s Project for Excellence in Journalism report: “The Explosion in Mobile Audiences and a Close Look at what it Means for News,” released Oct. 1, 2012. The proportion of Americans who read news on a printed page – in newspapers and magazines – continues to decline, even as online readership has offset some of these losses. Just 23% say they read a print newspaper yesterday, down only slightly since 2010 (26%), but off by about half since 2000 (47%). The decline of print on paper spans beyond just newspapers. The proportion reading a magazine in print yesterday has declined over the same period (26% in 2000, 18% today). And as email, text messaging and social networking become dominant forms of communication, the percentage saying they wrote or received a personal letter the previous day also has fallen, from 20% in 2006 to 12% currently. There has been no decrease in recent years in the percentage reading a book on a typical day, but a growing share is now reading through an electronic or audio device. While print sources have suffered readership losses in recent years, television news viewership has remained more stable. 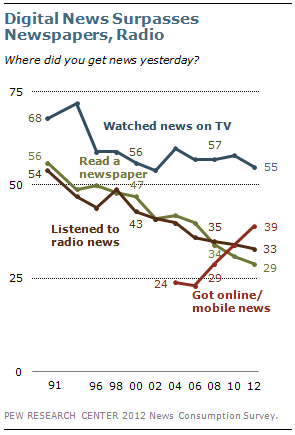 Currently, 55% say they watched the news or a news program on television yesterday, little changed from recent years. But there are signs this may also change. Only about a third (34%) of those younger than 30 say they watched TV news yesterday; in 2006, nearly half of young people (49%) said they watched TV news the prior day. Among older age groups, the percentages saying they watched TV yesterday has not changed significantly over this period. The changing demographics of the TV news audience are particularly noticeable in the audiences for local and cable news. The overall share of Americans saying they regularly watch local television news has slipped from 54% in 2006 to 48% today – and in that regard it remains one of the news sources with the broadest reach. 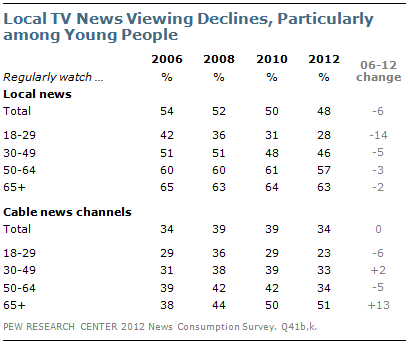 But the number of 18-to-29 year-olds regularly watching local news has fallen from 42% in 2006 to 28% today. Over this same period, the regular audience for cable news also has aged. 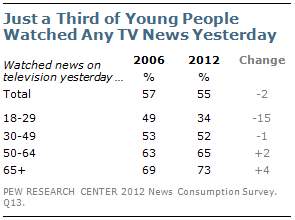 In 2006 and 2008, there were only modest age differences in regular cable news viewership. But in the current survey, more than twice as many of those 65 and older as those younger than 30 say they regularly watch cable news (51% vs. 23%). Among individual cable news outlets, CNN’s regular audience has declined since 2008. Four years ago, nearly a quarter of Americans (24%) said they regularly watched CNN; that has fallen to 16% in the new survey. 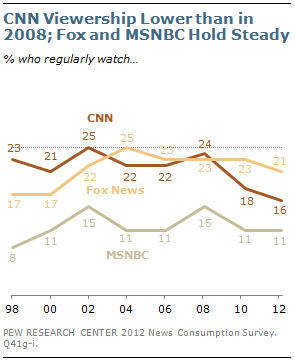 Regular viewership for both Fox News and MSNBC has not changed much in recent years. About one-in-five Americans (21%) say they regularly watch Fox News, while about half as many (11%) say they regularly watch MSNBC. While Americans enjoy reading as much as ever – 51% say they enjoy reading a lot, little changed over the past two decades – a declining proportion gets news or reads other material on paper on a typical day. And there is new evidence in the survey of a shift in reading to electronic platforms. In the new survey, only 29% say they read a newspaper yesterday, with just 23% reading a print newspaper. 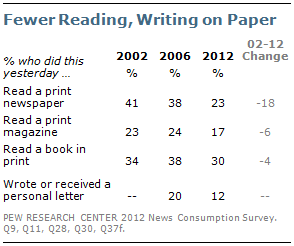 Over the past decade, the percentage reading a print newspaper has fallen by 18 points (from 41% to 23%). Somewhat more (38%) say they regularly read a daily newspaper, although this percentage also has declined, from 54% in 2004. Figures for newspaper readership may not include some people who read newspaper content on sites that aggregate news content, such as Google News or Yahoo News. Over the past decade, there have been smaller declines in the percentages of Americans reading a magazine or book in print (six points and four points, respectively) than for newspapers. Just as online newspaper readers make up an ever-greater share of all newspaper readers, so too are more magazine readers and book readers abandoning the printed page for tablets, digital books and other devices. In the current survey, 9% of those who said they read a magazine yesterday, and 20% who read a book, read them in a non-print format. 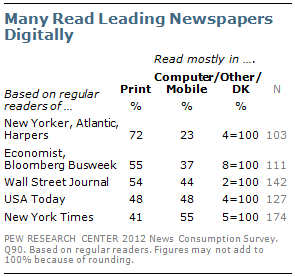 And substantial percentages of the regular readers of leading newspapers now read them digitally. Currently, 55% of regular New York Times readers say they read the paper mostly on a computer or mobile device, as do 48% of regular USA Today and 44% of Wall Street Journal readers. By contrast, most readers of such magazines as Harpers, the Atlantic and the New Yorker still read them in print. But even for these magazines, nearly a quarter of regular readers (23%) say they read them mostly on a computer or digital device. While traditional news platforms have lost audience, online news consumption has been undergoing major changes as well. Nearly one-in-five Americans (17%) say they got news yesterday on a mobile device yesterday, with the vast majority of these people (78%) getting news on their cell phone. Among smartphone owners, nearly a third (31%) got news yesterday on a mobile device. The second major trend in online news consumption is the rise of news on social networks. Today, 19% of the public says they saw news or news headlines on social networking sites yesterday, up from 9% two years ago. And the percentage regularly getting news or news headlines on these sites has nearly tripled, from 7% to 20%. On top of the increase in social network use, the poll finds that news is also more prevalent on social networking sites. 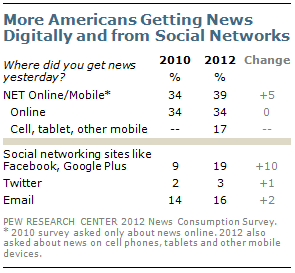 The share of users who saw news there yesterday nearly doubled from 19% to 36% between 2010 and 2012. The increasing use of these sites for news has not just occurred among young people. In fact, those in their 30s are nearly as likely as those 18 to 24 to say they saw news or news headlines on Facebook or another social networking site yesterday (30% vs. 34%). 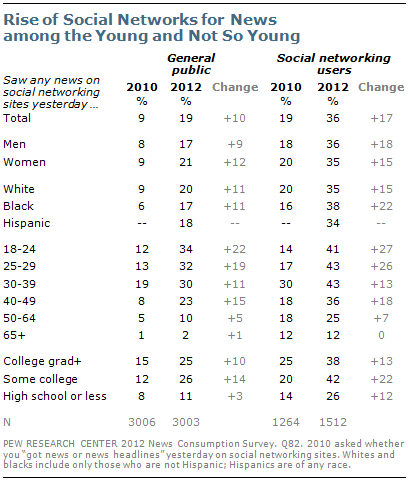 And about a quarter of adults in their 40s (23%) saw news yesterday on social networks, up from just 8% in 2010. The two trends in online news consumption – growing numbers getting news via mobile devices and the increasing use of social networks – are complementary. Overall, 55% of Americans access the internet on a mobile device, such as a cell phone or tablet; among this group, 30% say they saw news on social networking sites yesterday. That compares with just 9% of Americans who are online but do not access the internet on a mobile device. While news gathering is very common among Twitter users, the overall reach is limited because the audience remains relatively small. About one-in-ten Americans (13%) ever use Twitter or read Twitter messages. By comparison, more than half (54%) ever use other social networking sites, such as Facebook, Google Plus or LinkedIn. 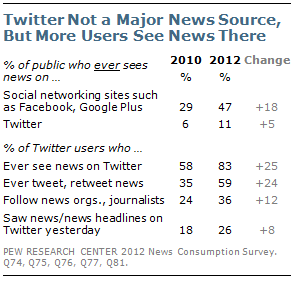 As a result, far fewer people get news on Twitter than on other social networking sites. Just 11% ever see news on Twitter, while 3% got news there yesterday. Nearly half of adults (47%) ever get news on Facebook and other social networking sites and 19% got news on one or more of those sites yesterday. Nonetheless, Twitter users are increasingly getting news on the site and sharing news stories with others. Overall, 83% of Twitter users ever see news on Twitter and 26% saw news there yesterday; both percentages are up considerably from two years ago. And most Twitter users (59%) tweet or retweet news headlines on Twitter. About the same percentage of users of Facebook and other social networks (61%) use those sites for sharing news or news headlines.